I’ve got an addiction. I’m taking the first step’s in curing the addiction by confessing publicly. It’s all apple’s fault. First they make a great device in the iPhone, then they make it trivially easy to download app’s to it. Yes, that’s right – I’m addicted to iPhone app’s. I think what’s key is that the range of app’s plus the power available in the iPhone make for a really good mobile platform. Some task’s are easier to do on the move – tracking weight, car costs, photo’s, twittering – the list goes on. Many tasks that I used to manage via spreadsheet on a desktop machine are now managed by a small app on the iPhone. One issue with some app’s is how to get the data out of them at a later date. Some allow for exporting or backup via e-mail but that is few and far between. Analytics – £3.49 – I use Google Analytics to track all my websites. This app allows we to pick any of the sites I track and see over 40 different reports on site traffic, visitors etc. I prefer this to the actual analytics website. Deliveries – £1.79 – I order a lot of, mmm, stuff online. This app allows me to track deliveries of said stuff. Again, easier to see status via this app than it is visiting each individual website or courier company to check on progress. Looks great too. Tumblr – Free – Good app that let’s me update my Tumblr site. Convertbot – £1.19 – Unit converter with a great interface. Replaced the free Units app – it’s that good. Skype – Free – It’s Skype on the iPhone. Not much else to say – installed as a just in case app rather than an essential for me. Dictionary.com – Free – Many dictionaries on the iPhone cost around $20. This is free, lot’s of content and a thesaurus as well. Very useful and I use it quite often. Night Stand – £0.59 – Gorgeous clock for the iPhone. Was never really sold on it but once I picked up a MovieWedge I know find it really useful when travelling. No need to depend on hotel having a good clock and it’s great to have it so large as my eyesight without glasses is really poor. Runkeeper Pro – £5.99 – Use the app to track and later analyse my hill walks. Super reliable so far and new features added frequently. 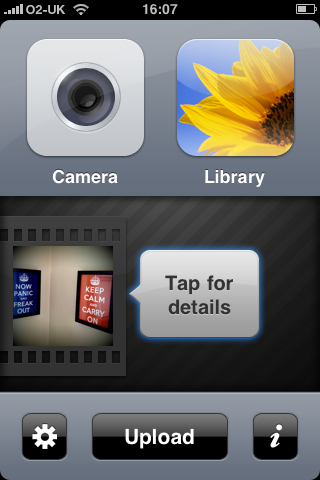 Camerabag – £1.79 – Allows you to apply some nice post processing to photo’s. Recommended in this article in taking better iPhone pictures. Tried it a few times now and can work really well. Pano – £1.79 – Allows you to stich together iPhone pictures into a panoramic of up to 16 images. I’ve found it a bit hit and miss when trying it. Interface is lovely though, overlaying current view over previous image allowing you to line up the photo better. Flickit – Free – Let’s you upload images to Flickr. Supports tag’s, sets and geocoding of images. Best interface of any of the Flickr uploaders makes it really easy to use, and quick too. Highly recommended. Audioboo – Free – Let’s you easily create audio podcasts/blog on the move. Has some potential but can’t see me using it that much. GB Locate – £0.59 – Displays current OS grid position and latitude/longitude using iPhone GPS. Been very handy on the hill walks to confirm exactly where we are with the map. iOSMaps – Free – Using GPS, the app will return the OS map for your current location. It downloads the map from a server so you need a good connection, hence can’t be replied upon for hill walking. I’ve found it to be a bit crash happy. Google Earth – Free – It’s Google Earth. On the iPhone. Technically impressive but not often used. Wikipanion – Free – Nice app for accessing Wikipedia articles – quicker than firing up Safari and searching. Road Trip – £2.99 – For tracking car expenses. Always mean to do this but would forget how much I filled up by, what the mileage was etc. Being able to track on the iPhone is much easier as it’s easily done at the garage. ITN News – Free – The best UK news app. Video reports and it’s quick too. Surprised by how good this is. More suprised that the BBC haven’t released their own app. TED – Free – Technology, Entertainment and Design (TED) conference app. While it replicates the podcast schedule the advantage of the app is that you can search for any published content and also bookmark favourites which I’ve done. Pretty fast to use too. Qype Radar – Free – Search for local restaurants, markets etc. Difference is that there are reviews on each result so you can usually sort the good from the bad. Handy for frequent travellers. Yelp – Free – Much the same as Qype – maybe slightly less UK content though? 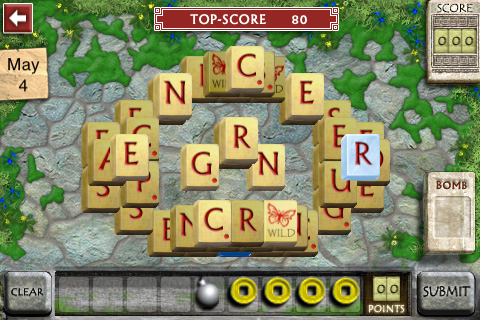 WordJong – £1.79 – Cross MahJong with Scrabble and you get this great game. Every day presents a new game board and some of the challenges are really tough. Played this almost daily since I bought it and it’s still very enjoyable. Frenzic – £1.79 – Fast based action/puzzle game that’s ideally suited to the touch interface on the iPhone. Played lot’s at first – now just an occasional blast. Tap Tap Revenge 2 – Free – New version, better graphics, same Rock Bandesque gameplay. Nice but doesn’t draw me back. Zen Bound – £2.99 – One of the most original games I’ve played on any platform. 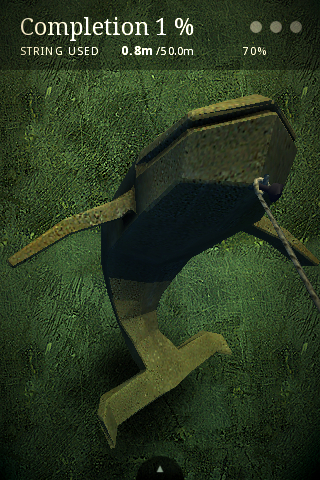 Concept is simple – wrap a rope around a 3D object. But the presentation polish, the graphics and the sound (wear headphones for this one) makes for a great experience. Contraption – £2.99 – Build a machine to move a ball and complete a goal. Simple concept, complex puzzles but I got bored with it. iDracula – £0.59 – Arcade shooter. Great graphics, can quite quite intensive but I got bored with it. Lets Golf – £3.49 – Think Hot Shots Golf for the PSP and you’ve got this game. 4 courses, great cutesy arcade graphics but an accurat control method make for a challenging game. Recommended. Flight Control – £0.59 – Surely everyone has this by now? Land planes by drawing their flight path. Simple concept, great fun to play and highly addictive. If you buy one game, get this! Glyder – £0.59 – Fly around levels collecting orbs. Graphically superb but not much of a hook. Take this engine and make Pilotwings! That game would rock on the iPhone. Who Has The Biggest Brain – £0.59 – Shakeel pointed this one out to me and it’s great. Think Brain Training on the DS and that explains the game. Uses Facebook Connect so you can see how your friends are performing. Cheap and a lot of fun – nice way to fill 10 minutes. Scrabble – £5.99 – Fairly steep and only just out in the UK (been out for months in the US) but I love it. Can play against AI, another iPhone or two player sharing the one device. Only criticism I have is the dictionary – the AI comes up with some incredible words especially at the highest difficulty. Tiger Woods PGA Tour – £5.99 – 7 courses and great use of the touch interface. The graphics are very good and it’s a challenging game. Only just out last week but already a favourite. iFighter Lite – Free – Currently a one level demo game but the proper release is coming soon. If you’ve played 1942 before and it enjoyed it then this is for you. Best tilt control yet I think, probably due to the calibration in the game. There is some slow down when playing which will hopefully be addressed in the paid release. There is one downside to this addiction. It cost’s money! So far my spend on the App Store is £156 since July 08. That’s a lot of money, far more than I expected. A few purchases early doors were regrettable as better app’s have been released or free alternatives have turned up but overall I’m really pleased with the app’s I’ve got. For another list of iPhone app’s have a look at Gordon’s latest updates – that’s where I found the Flickit app. Any good app’s that you use that I haven’t got?